Between 1975 and 1979 the tyrant Pol Pot's regime claimed the lives of more than 1m people, mainly doctors and teachers, as the Khmer Rouge tried to turn Cambodia back to the middle ages. In 1979 the Vietnamese invaded, drove the Khmer Rouge out and installed a new Communist government. For the next 12 years the teaching of English and other western languages was made illegal and it was only after democratic elections in 1993 that this stance changed significantly. Cambodia remains an extremely poor country still dependent on donors to supplement its very low GDP. In common with many third-world counties, the present education system is chronically under funded both in terms of infrastructure and teacher salaries. The majority of teachers earn the equivalent of £20 per month. In theory, education is free; however as a result of such low wages, teachers tend to supplement their salaries by imposing various charges on students. This in some cases results in children being withdrawn from school due to domestic financial difficulties. The principal, Saveoun Im, has been involved in teaching English since 1995 when he started teaching English to a few students in his local pagoda for a few pence each a day. He was then 17 years old. This money helped him afford to go to school in the afternoon. 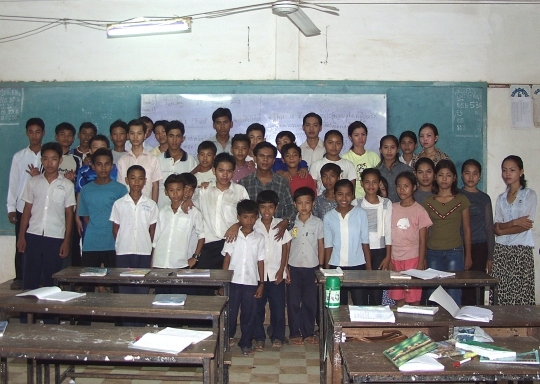 Saveoun has been a partner in a number of private schools in Phnom Penh. In 2000, he bought out his fellow partners in the Beng Trabek Language School and re-named it the Big Ben Language School in recognition of a cold and very wet visit to London in 1999 and as a nose thumbing to the Statue of Liberty, which adorns the gate of a rival establishment! Since 2002 Saveoun has opened schools in two other locations and at the last count had approximately 400 students. He employs a staff of roughly 40: Ten Administrative staff (to fix the lights, collect the money and kill the snakes) and the remainder are teachers. For the vast majority of Cambodian children the prospects of obtaining worthwhile employment without knowledge of a second language is minimal. Many are denied the chance to acquire a minimum standard of spoken English as their families cannot afford even the minimum $1 per month that pays for the room rent, electricity charges and whiteboard markers. In January 2004, Chris Conwell (founder of Zycon Domains) agreed to fund the Big Ben Language School's teacher's salaries on an on-going basis and continues to do so. The children and staff at the Big Ben School are very enthusiastic about receiving visitors from the West, and if you are planning a trip to Cambodia, it offers the opportunity to see and understand the real experience of being a child growing up there. The children are happy to answer questions and will have many of their own, and it is usually possible to take part in a lesson (subject to prior arrangement) for a truly unforgettable experience. If you are planning a visit and would like to learn more, please email Peter Parry MBE or Roger White for further details.